I spent a few hours today crunching the numbers in the new Marion County House Districts. Because the House has a list of precincts in each proposed district I was able to look at the partisan leanings of the district using 2010 baseline numbers. The House Republicans also have a high resolution map available. First a word about the methodology. As my low profile race for the baseline numbers, I used the results in the county recorder's race. Three districts go outside of Marion County: 88, 91 and 93. (I was incorrect when I earlier said HD 40 came in from Hendricks County into Marion County. I didn't read the map correctly). However, the Marion County parts of those three districts were already strongly Republican so taking them outside of Marion County didn't really create an advantage. This is contrary to the strategy of the Senate of going outside of Marion County to pick up Republican votes to turn an otherwise Democratic district into a Republican. The numbers for 88, 91 and 93 only reflect the Marion County baseline numbers. The good news for Republicans is that 8 of the 15 districts favor the GOP. The bad news for Republicans is that the Democrats would appear to immediately have good shots at winning four of those 8 Republican-leaning districts (87, 89, 92 and 97). On the other hand, Republicans appear to have shots at wining just two Democratic leaning districts (86 and 100). While it does look like there was some packing of Demcoratic votes in several districts, Democrats can't complain that the Republicans drew only safe seats for themselves. The 15 person Marion County delegation could easily swing to 11-4 in favor of the Democrats. Paul, From looking at the map for Marion County, it appears that Mary Ann Sullivan is now in the 100th District instead of her 97th District. John Day currently represents the 100th District but has seen his neighborhood carved out and thrown into a neigbhoring district with Porter and DeLaney. The 97th is slightly more Republican, while the 100th is more Democratic. The early reports I heard was that there was no Democratic incumbent in the 100th District as proposed. Unless I'm confused about where Sullivan lives, she would appear to be in the 100th instead of the 97th, which would be open. Hoping someone can confirm that one way or the other. Maybe she's a few blocks west of the boundary line and still in the 97th. Gary, I'm not sure. I didn't know enough about where the individuals live. Sullivan of course is now in 97. If someone has Sullivan's address, one could figure out what precinct and you could get confirmation that way. 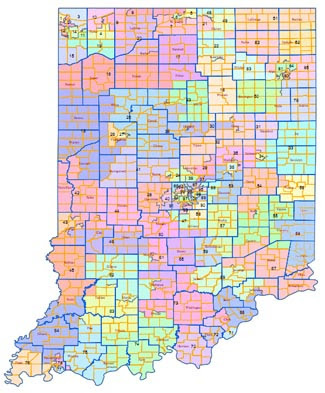 I think Bosma is getting unfairly criticized about the maps, at least for what he did in Marion County. I was thinking she lived in the newer condos south of my neighborhood, but she actually lives over by the canal on W. Walnut. The city has changed so much that we Rs have a better shot at two districts containing center township (97 and 100) than we have in districts containing the northside townships.